Oran Kearney and Swifts manager Rodney McAree. 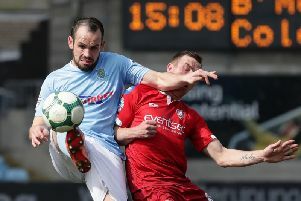 Oran Kearney said he knew his side would be in for a tough battle against Dungannon Swifts on Saturday. The Bannsiders edged out the Swifts by a single goal at The Showgrounds to maintain their grip on the top of the Danske Bank Premiership. Speaking after the game Kearney said he knew his side would have to work hard to break down their opponents' strong defence. "When we looked at the stats before the game Dungannon have the best defensive record in the bottom six, I think they've only conceded 31 goals," he said. "I looked down their list of results this morning and they only really win or lose by a goal. "So I had a fair idea today wasn't going to be free flowing all-attacking football. "Yes they might not get loads of chances, but at the other end it would be about being patient and trying to break them down. "It looked like it would take a set piece or a fantastic bit of quality, and so it proved with a real quality strike from Darren. "When we do that they change tact and throw on three more flair players. "Rodney said to me afterwards they wanted to stay in the game as long as possible and went with grafters to see if they could stay in it until 60 or 70 minutes. But when we got the goal they have to change things earlier so it opens up and it suited us more. "However, they had two good chances which Chris Johns saves well. "We had four or five chances that with a little bit more care and extra quality we would have got the second and killed the game off. "So that's the only bit of frustration I have is we didn't get that second goal. "But I said to the boys it's been a long time since we have had a 1-0 win, but they are good wins to have. "Going into the closing stages bar the two scares we had we were comfortable, and we saw the game out with everything we have learned over the last couple of years." Coleraine's game was one of only two top flight clashes to beat the weather, and Kearney admitted his side knew they had to take advantage of the other teams' inactivity. "Yes there was probably gains to be made today," he said. "I said to the boys beforehand that with the other games called off we wanted to extend the gap between us and them. "It's alright having games in hand but you still need to win them. I'm a big advocate of getting the game played and getting the points on board."